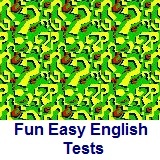 ﻿ Fun Easy English - new american english grammar topic abstract noun. In this lesson you will learn the definition of an abstract noun, study examples of abstract nouns, and take a test. I know the importance of learning English. I would like the opportunity to study abroad. She needs to have more confidence. Happiness means different things to different people. You should save your money for your education. She has a lot of pride. For each test question, fill in the blank with the abstract noun which best fits with the context (meaning) of the sentence. 1. I really need your ________ about this relationship. 2. They accumulated an incredible amount of ________ this year. 3. You really need to think about your ________ next time. 4. They fell in ________ from the first time they met. 5. The test shows she has above average ________. 6. There is a lot of ________ coming from that house anytime. 7. We try to ________ to Japan at least once a year. 8. The ________ in California is not as good as it used to be. 9. They said she has ________ which explains why she gets so upset. 10. You need a lot of ________ if you want to succeed in this world.